April, May and June include no less than seven significant events on the Dutch calendar – and lots of excuses for a party. Schools are also closed for a week or two around the end of April for their spring break but if you are crafty with the public holidays, you hardly need eat into your official holiday entitlement. Easter (Goede vrijdag, 1e and 2e Paasdag) take place end of March or April. The Dutch are very keen on Easter eggs and spring-related decorations, and many homes will put up willow branches hung with tiny wooden eggs. Easter Monday is a public holiday but Friday is a normal working day, apart from for government workers. If you have children at a Dutch primary school, they, rather you, will probably have to make an Easter breakfast box which they will give to another child in their class. This is a shoe box beautifully decorated with Eastery things and should contain all the ingredients for a delicious breakfast. Some schools have banned jam and sweet things, white bread and even chocolate eggs… which is a little odd. But hey, a cheese sandwich can be festive as well. The Dutch also like to paint boiled eggs in pretty patterns. If you want to do this, be sure to buy a proper egg stand at Blokker or Intertoys so you can colour your egg without getting paint all over your fingers and the rest of the eggs in the box. Don’t forget, the Netherlands has a Paashaas – Easter hare – rather than a bunny. April 27 is birthday of king Willem-Alexander, who decided to ditch the Koninginnedag – Queen’s Day – celebrations and make them his own. April 30 was the birthday of queen Beatrix’s mother, Juliana. When Beatrix succeeded her mother in 1980, she decided to keep the celebrations on that day – which is also a public holiday. Beatrix also scrapped the formal file-past at Soestdijk palace and introduced the ‘meet and greet’ visits instead. But when she retired in 2013, Willem-Alexander decided to switch to his own birthday. Traditionally citizens do not need a permit to sell goods on the street on Queens Day which is why Amsterdam turns into a giant flea market. There is no escaping the Dutch national colour orange either. Remembrance Day commemorates all civilians and members of the armed forces who have died in wars or peacekeeping missions since the outbreak of World War II. The main wreath-laying ceremony takes place at the National Monument on Dam Square in Amsterdam, which is usually attended by the queen and other royal family members, ministers, and military leaders. At 20.00 hours there is a two minute silence. Every year there seems to be some sort of row about any kind of attention for the German war dead. Liberation Day celebrates the end of the occupation by Nazi Germany during World War II. Events kick off in Wageningen – where the German capitulation was signed – and the Liberation flame is lit shortly before midnight. Torches are then taken by runners, cyclists and inline skaters to other Liberation fires all over the country. 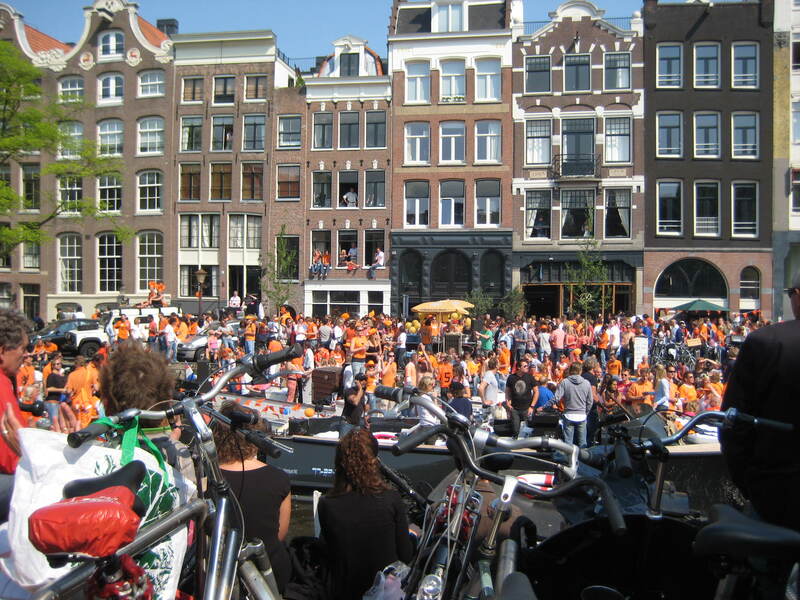 There are also Liberation Day festivals, featuring top pop acts – one in each province and one in Amsterdam. Every five years, Bevrijdingsdag is an unofficial public holiday but that happens next in 2015. In the Netherlands Mothering Sunday is always the second Sunday in May, as it is in America and many other countries. This is the day when all Dutch people visit their mums and take them flowers – you won’t be able to avoid the advertising. If it is sunny, Moederdag is a good day to go to the beach because everyone is visiting mum. A public holiday in the Netherlands, Ascension Day marks the day the resurrected Jesus was taken up to heaven in the presence of eleven of his Apostles. Lots of people take Friday off as well, to create an extra long weekend – which often can be worked into the May school break. In the Netherlands, 2de Pinksterdag, or Whit Monday, is a public holiday. The Pinkstergemeente – or Pentecostal church – is an evangelical Protestant grouping with around 120,000 followers in the Netherlands. This entry was posted in Uncategorized on March 17, 2013 by europeansinthenetherlands. For clarity, I would like to add that the two minutes silence at Dodenherdenking is rather a mandatory thing, which is followed virtually everywhere. If you wish to ignore it at home, that’s fine. But if you don’t want Dutch people to be angry with you, be as quiet as they are when you are close to them during these 120 seconds. Also, nice of you to explain Pinksteren, that the overwhelming majority of Dutch people, being rather secular, do not know the origin of. Not that that is an impediment for anyone to enjoying a day off of course. The origin of pentecost has nothing to do with the church that was named after it..
Three of those days are not even real holidays. May 4th and 5th we don’t get a day of and moederdag is not an official holiday. So there are 4 days of in three months, and then we have to wait till Christmas until we have another holiday. Also, if a holiday happens to be on a Saturday or a Sunday, we don’t get the Friday before or the Monday after off. Ehm… I don’t think queen’s day was ever on April 20. More like April 30. But I’m just nitpicking. Love your blog. Oops… typo while rewriting. Thanks for pointing it out.